In 2019, Toujours France celebrates its 20th anniversary – 20 years of wonderful travels, many destinations, and the birth of life-long friendships. 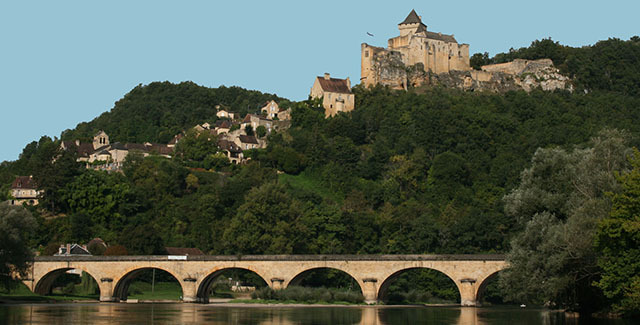 On this tour we explore the stunning Dordogne region, and as it is a short tour of just one week, you can combine this with other travel arrangements in Europe, or may we suggest a beautiful barge cruise afterwards?! The south western French region of Perigord, or as many of us know it, the “Dordogne”, is a feast of historic sites, perched villages, deep river valleys and the “land of 1,000 chateaux”. Duck, goose, foie gras, walnuts and truffles are just some of the highlights of the cuisine of this stunningly beautiful region, and the full bodied red wines of Bordeaux the perfect accompaniment. Our tour embraces the history of the Hundred Years’ War, the ancient castles, prehistoric cave art and some of the most picturesque medieval towns and villages of France. Our first stay is in a beautiful country setting, a gorgeous Relais & Chateaux hotel in the tiny village of Tremolat, on the banks of the Dordogne River. Our next location in the perfectly preserved town of Sarlat-La-Caneda, with its honey coloured stone and lauze rooves, each evening is a treat as we wander among cobbled streets, discovering shops, restaurants and truly awe-inspiring buildings. We can suggest available barge cruises at time of booking! Meals as per itinerary (all include wine), breakfasts throughout the tour, private air conditioned buses on day tours, accommodation in luxury hotels, all entries and excursions, the full time services of your tour director Sue Heine. This morning we continue to our second stop for the week, the exquisite town of Sarlat-La-Caneda. Due to impeccable restoration after WW2, Sarlat has remained preserved and one of the towns most representative of 14th century France. It is absolutely stunning and a delight to wander in, especially in the evenings when the stone buildings of the old town are beautifully illuminated, creating a magical ambience. After our arrival we’ll settle in to our hotel, which is located just on the edge of the old town, and then discover the history, beauty and wonderful architecture of Sarlat on a walking tour of the historic centre. Today we visit the perched village of Rocamadour, which boasts one of the most fascinating histories in France. Rocamadour has been an important pilgrimage destination for 1000 years – built on the site of an original shrine to a Madonna, the shrine became famous for its healing powers, and soon became a stop on the pilgrimage path to Santiago de Campostela. Another reason for our visit is because of the beautiful and dramatic setting of the village, tumbling down the cliff side. Today our tour in the south-west ends and we will arrange your transfer return to Bordeaux, or help you make arrangements to your next destination!